This month's quiz- What's the big deal about this road? Scroll down for the answer! I remember as a young boy, lucky enough to have breakfast at the storied New York hotel, the Waldorf Astoria, started by the Astor Family. It was a bit of deja vu as I saw the new sign go up on Tom Darlington Blvd heralding the arrival of Waldorf-Astoria in Carefree. The world-famous Boulder Resort with it's signature rockpile and Flintstone-like casitas continues with the cachet of the Waldorf-Astoria Resorts. The Boulders Resort is always regarded by professionals as one of the top resorts in the country, and repeats year after year as the number resort in the Hideaway Report. On March 27, 2009, the resort joined the Waldorf Astoria Collection of hotels, which is a part of the Hilton Hotels group. The 1300 acre facility features two 18 hole golf courses, the stunning Golden Door spa, and a variety of housing areas of many price ranges, located both in Carefree and in North Scottsdale. It was rumored that in the early days, Club Med had also been interested in the property for their first US desert club, but was outbid by the original developers. The architect of the new resort, Bob Bacon, did such a high-regarded job on his design, that one family hired him to build their home as a replica, incorporating many of the design touches the Boulders is so famous for, including the massive hand-carved and shaped doors. While being owned by the Blackstone Investment Group in 2006, the Boulders Resort made the jump into "green" tourism by going to an all-organic resort, which even encompassed the famous Latilla Restaurant. Everything had to be organic and healthful from fish, which had to be caught on a line, not raised in a farm, to herbs and produce, taken from the Boulders special on-site herb garden. There's no word on what changes are planned at the resort but it's said rooms will continue to be renovated and upgraded. The Boulders Resort, despite it's drop-dead views, spectacular boulders with a waterfall running down one of them by the pool, continues to be plagued by criticism of bad service and outdated rooms. We hope the Waldorf and Hilton can restore that to it's glory days, and hold onto the property for a long period of time. Is it about time for Carefree's own "Praying Monk?" 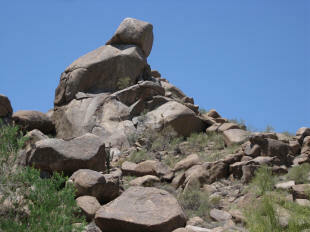 Everybody knows that Paradise Valley has a Praying Monk formation on the Northwest side of Camelback Mountain, but the next time you're driving in Carefree on Tom Darlington Road, look for our own intriguing formation, across the street from the Boulders Resort, on Black Mountain. Some say it looks like a Praying Monk as well, although we've also heard comparisons to a helmeted Chinese warrior, and even a spaceman! What do you think? Carefree (PW)-One of the craziest things we keep hearing out this way is that "things are still going down, we haven't hit bottom." Very sorry to report "you missed it. Should have been here in September!" This has been an astonishing home sales season out here. According to Fannie Mae numbers, Carefree is now an ascending real estate market. Terravita going up, Anthem rocketing up. The supply of available properties in Maricopa County, which several years ago approached 60,000 homes, condos and townhomes. Now, below the bell weather amount of 30,000. See the Real Estate stats for more. Carefree, which can have 150 homes for sale this time of year, only has 70. Agents say they have not been busier for five years. And buyers are hard-pressed to find anything move-in ready for less than $ 500,000. And March marked the first month where NO bank-owned properties were put on the market. Normally, Carefree has had about 15 bank-owned and distressed properties on the market, now down to 6, and 24 homes are under contract right now. 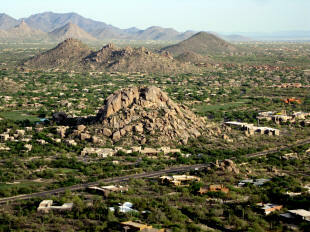 Scottsdale, in the last few months, has seen the number of bank-owned properties plunge by 50%. Buyers are quite shocked when arriving in town to "steal" a property, to find there is little left. At the popular Mirabel golf club, which was loaded with bank-owned homes a year ago, has no distressed property remaining, as of this writing. And one home there on 103rd Place, listed for $ 822,900, got 47 offers on it and closed for around $ 1.13 million. Multiple offers and battles to get well-priced properties are the norm. Still, if you can find anything, it's a great time to lock in to a house, but you're not at the bottom anymore! Mountain Lions let willing golfers play through! 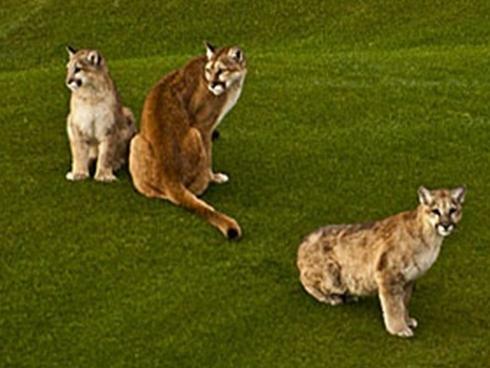 The fourth hole of a desert golf course near Phoenix offered an unexpected obstacle and spectacle earlier this week: a mother mountain lion and her two cubs, The Arizona Republic reports. Linda and Ty Borman live on a private tract next to the Desert Mountain Golf Club's Cochise Course in Scottsdale. Monday afternoon, Ty's habit of "looking out the window in hopes of seeing something" paid off, Linda said. The big cats were lounging on the fairway of the 546-yard, par-5 hole. She called it a "once-in-a-lifetime spectacle." He called it a " 'National Geographic' moment." The Bormans had seen other native wildlife before -- javelinas, bobcats, coyotes, diamondback rattlesnakes -- but never mountain lions. The Cromford Report says home closings are impressive! "The most impressive thing about the month of March 2011 was the huge unit volume of closed sales. We are currently showing 9,901 closed sales on ARMLS for all areas and types. That is the 5th highest monthly total ever recorded on ARMLS and the second highest sales volume ever for the month of March. The only months which have surpassed it were June 2005 (10,213), August 2005 (10,002), June 2004 (9,973) and March 2005 (9,949). Please see the long term sales chart to see how significant this number is. Meanwhile demand is accelerating while supply is falling quickly. This is reflected in the Cromford Market Index™ and can be see here in graphical form. Supply is falling in almost every geography and price range but is most noticeable at the price ranges below $150,000 and in the outskirts of the valley, particularly in Maricopa (city), Queen Creek, Anthem, Casa Grande and Buckeye, This largely due to enthusiastic buying of homes built in the last 15 years which can be found for sale at a discount of 70% or more compared with their price at the time of construction. Trustee sales in Maricopa County hit a high number of 5,226 in March, due to the trustees catching up from the Bank of America moratorium in November last year. Notices of trustee sales were only modestly up from February at 5,397, which is not an impressive number given that March contained a lot more working days for lenders than February. As a result the number of homes pending foreclosure dropped sharply during March to the lowest number since March 2009. Third parties buying at trustee sale made a new record with 1,379 purchases (26.4% of the auctions). This is by the far the largest number of properties ever purchased at trustee sale." Amazing snow blankets the mountains North of Carefree by the Gold Hill gold mine. It was all gone at the end of the day and temperatures in the 90's baked the area a week later!. One of the highest homes ever built on Black Mountain hits the market! Carefree (PW)-Talk about a place to keep out the paparazzi! Double gates and a spectacular road lead to one of the newest real estate offerings in Carefree, listed by Russ Lyon Sotheby's International for $ 3.79 million dollars. It's rumored that this residence was built by the man who use to own most of the mountain, who picked this spot for the wide-open views from the East to the West. He even chiseled out an area for a personal tennis court which was never built. The home, which was originally built in Santa Barbara style, had a $650,000 interior remake in a more contemporary fashion. It's shown by appointment only to qualified buyers. 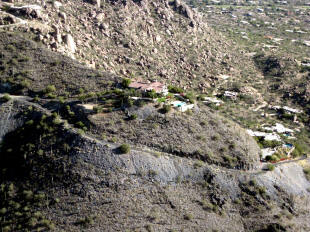 See below what a night view this home has, perhaps the greatest view property in all of Phoenix! Answer to this month's quiz- What's the big deal about this old road? This is the last remnants of a notorious mining path in the Mexican Hat Wash. In 1874, discovery of gold at Gold Hill brought thousands of treasure seekers to the area. The gold ore was so rich that they carried it out along this path, through what is today Desert Mountain golf community. In Cave Creek, the ore was transferred to buckboard wagon and taken to Prescott. Then by train to San Francisco and finally, by boat to England for smelting. This journal half-way around the world, started on this road. 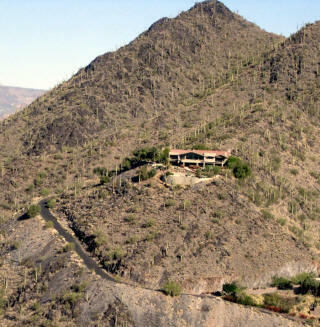 Gold Hill mine is for sale, by the way, for $ 43 million dollars and is Scottsdale's biggest land offering, featured on TV and by the Arizona Republic's Peter Corbett.